Most people who have read my retrocomputing series probably have some familiarity with 3 1/2″ drives or with 5 1/4″ drives. The 8″ drive preceded the 5 1/4″. I never had the experience, having entered the computer scene in the early 80s with a TRS-80 coco, starting out with a cassette tape and then moving to a 5 1/4″ drive. As such, I was anxious to try out some 8″ drives. Hard Sectored or Soft Sectored. Hard sectored drives feature physical marks on the drive surface that denote sector boundaries. These are typically picked up by something like an optical sensor. Soft sectoring uses index marks recorded on the drive. You record these marks during the formatting process. Soft sectoring seems to be the more modern of the two technologies. Single Sided or Double Sided. Some drives have two heads, and some have only one head. Single Density or Double Density. Some drives support a data rate of 250 Kbps using FM, whereas other drives support a data rate of 500 Kbps using MFM. I knew early on in my selection process that I wanted a soft sectored double-sided double-density drive. Also note that a variety of power sources are required for the typical 8″ floppy. Early drives required line power (120 VAC or 240 VAC) for the spindle motor. If you get one that requires line power, make sure it’s compatible with your country. Also required is typically 24 VDC and 5 VDC. Occasionally -5 VDC is also required. You may have to build yourself a custom power supply to get your ancient 8″ floppy drive working. When evaluating drives on eBay, you have to be wary that whatever you purchase may not function. 8″ drives could easily be nearly 50 years old. They may suffer from controller failures, head failures, alignment issues, etc. Often the parts to repair them are no longer manufactured. Some contacts on the vintage computer forum warned me about buying drives from eBay sources without a guarantee, that I could easily be buying junk that was not financially feasible to repair. Nevertheless, when a pair of Qume drives plus a case showed up for around a hundred bucks, I decided to give them a shot. The board on the left used pin headers. The board on the right used a card-edge connector for attaching to the 8″ so I can plug it directly into the 8″ drive. The card edge connector presented some particular challenges (hence it’s upside-down) and you can hear about them in the video. The odd pins (1,3,5,7,9,..) are all grounds. I described DSB and MOTEB as the PC’s “first drive select” and “first motor”. This is because PC floppy cables typically have a split and a twist, that reverses the DSA/DSB and MOTEA/MOTEB. 5.25″ and 3.5″ floppy drives often have motor signals to turn the spindle on and off. 8″ drives often do not. For example, my Qume runs the motor all the time. Reduced Write Current (RWC), also sometimes called LCT. As the head moves from the outside of the disk to the inside of the disk, the circumference of the tracks decreases. For this reason, the typical 8″ floppy drive will reduce the current to the write head on these inner tracks. In theory the WD37C65 controller I chose should support this signal (it repurposes the DEN pin), but I was unable to get it working. In my build, I have restricted the tracks to those that don’t require reduced write current until I get this resolved. Head Load (HDL). This signal tells the 8″ drive to activate a solenoid that will load the head against the disk surface. Many people recommend tying the PC’s MOTEB signal, since the behavior is similar. This means when the controller tells the drive to turn its spindle motor on, it will cause the head to be loaded. With either of these two signals, you might not even need them. You’ll have to consult your 8″ drive’s manual. 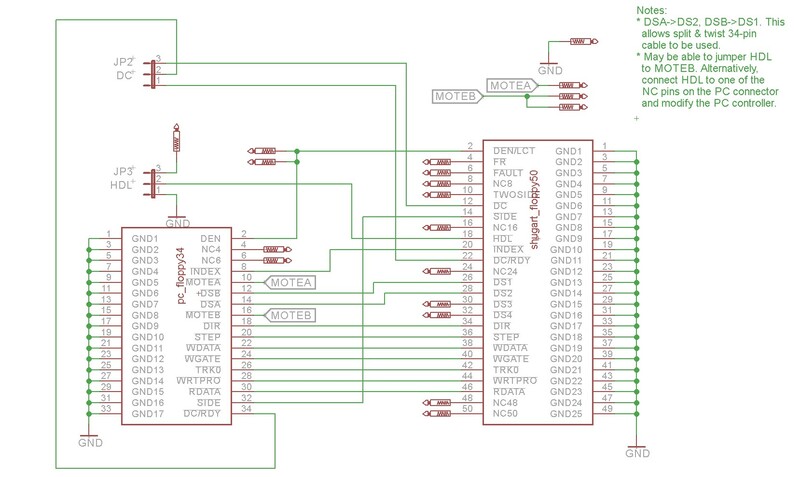 My Qume drives do need RWC, but they can be jumpered to operate HDL from drive select if desired. The controller I’m using, the WD37C65, does support a native head load signal. I routed the 8″ HDL (pin 18) to one of the PC connector’s unused pins (6), and then wired my controller to supply head load on pin 6. 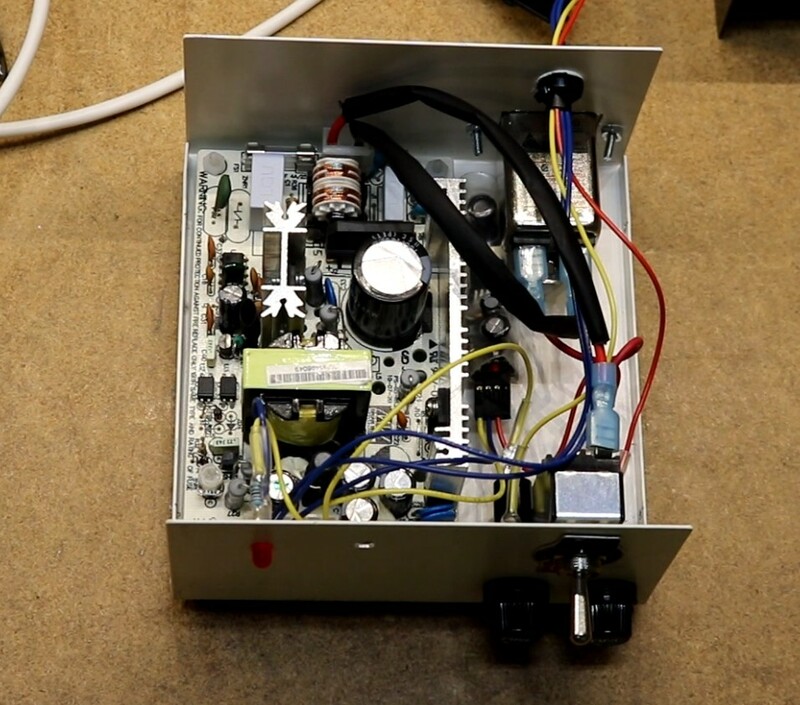 The large open-frame power supply is a 24V supply from Jameco electronics. I also added a power entry filter that accepts standard AC power cables, a toggle switch, a couple of fuses, and a status LED. It’s hard to see, but tucked alongside the open-frame 24V supply is one of my LM2576 5V switching modules. This supplies the 5V power necessary for the drive. The CP/M distribution I’m currently using on the RC2014 is called RomWBW. It already has a profile for supporting double-sided/double-density 8″ drives, so little work was necessary. All I did was change the number of tracks from 77 to 40 to workaround my current RWC limitation. My second home computer eventually had 2 QUME 8″ Double Sided Double Density drives. The drives alone cost $595.00 when new in the early 1980s.